Collecting duct carcinoma (CDC) of the kidney is a rare and aggressive malignant tumor arising from the distal collecting tubules which has been shown to have a poor response to several kinds of systemic therapy. We present a case of metastatic CDC that responded favorably to a multiple tyrosine kinase inhibitor, sunitinib, achieving a partial response in both lung and skeletal metastases. To our knowledge, this is the first report showing therapeutic activity of sunitinib against CDC. Considering these findings, it would be worthwhile prospectively investigating the role of multiple tyrosine kinase inhibitors, particularly sunitinib, in the management of metastatic CDC. Collecting duct carcinoma (CDC) of the kidney, also known as Bellini duct carcinoma, is a rare variant of renal cell carcinoma (RCC) arising from the epithelium of the distal collecting ducts; it accounts for 2% of all RCCs . Clinically, CDC is characterized by an extremely aggressive phenotype, accompanying metastatic diseases at presentation in most reported cases; the prognosis ofCDC is therefore poor, with approximately 70% of patients dying of disease progression within 2 years after diagnosis. In fact, several systemic therapies, including cytokine therapy and cytotoxic chemotherapy, have failed to achieve favorable response to metastatic CDC except for very limited cases [2–7]. Sunitinib is an orally available inhibitor of multiple receptor tyrosine kinases, including vascular endothelial growth factor receptor, platelet-derived growth factor receptor, and others, with direct antitumor and antiangiogenic activity. Based on impressive outcomes in several clinical trials, sunitinib has been approved worldwide for treatment of RCC patients with clear cell histology . Furthermore, significant therapeutic activities of sunitinib against non-clear cell RCCs, for example papillary and chromophobe carcinomas, have also been reported in recent studies [8, 9]; however, it remains unknown whether sunitinib has a therapeutic impact on CDC of the kidney. Here, we report the first case of a patient with metastatic CDC of the kidney who had a favorable response to sunitinib treatment. A 47-year-old man with a 14.1 cm left renal mass extending into the renal vein and metastases involving the bilateral lungs and retroperitoneal lymph nodes were referred to our institution. Radical left nephrectomy combined with lymphadenectomy was performed. 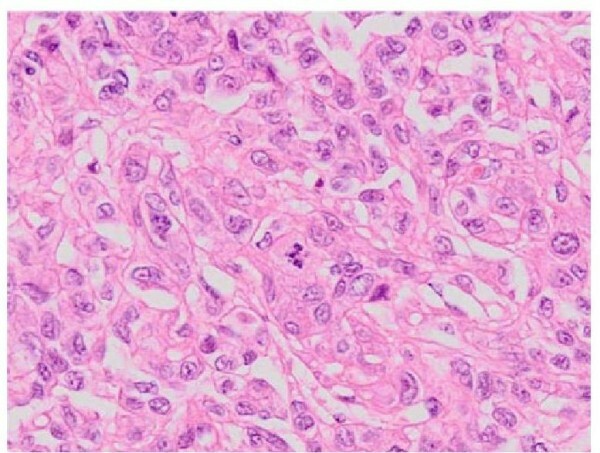 Pathological examination resulted in diagnosis of this case as CDC with tubulopapillary architecture consisting of tumor cells with eosinophilic cytoplasm and high-grade nuclei (Figure 1). 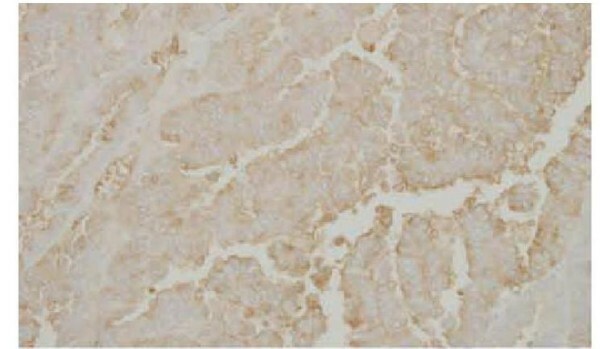 In addition, immunohistochemical staining was characteristic of CDC; that is, tumor cells were positive for Ulex Europaeus agglutinin (Figure 2), cytokeratin 19, 34bE12, epithelial membrane antigen and focally positive with vimentin . Following radical nephrectomy, this case was treated with sunitinib rather than systemic chemotherapy, considering her poor performance status. After 4 courses of sunitinib therapy with 37,5 mg daily schedule, metastases to the lungs and left rib decreased by more than 30% compared with findings before sunitinib treatment (Figure 3). Despite the favorable effects of sunitinib on metastatic diseases, pleural effusion appeared to be remarkable after the administration of sunitinib; however, cytological examination showed no malignant cells in the pleural fluid. In addition to pleural effusion, several adverse events associated with sunitinib treatment, including appetite loss, thrombocytopenias, and hypothyroidism, were observed. Thereafter, disease progression occurred 10 months after the initiation of sunitinib, and the patient died. Hematoxylin and eosin staining of tissue sections from the nephrectomy specimens demonstrating collecting duct carcinoma (× 400). Tumor showed positive staining for Ulex Europaeus agglutinin. 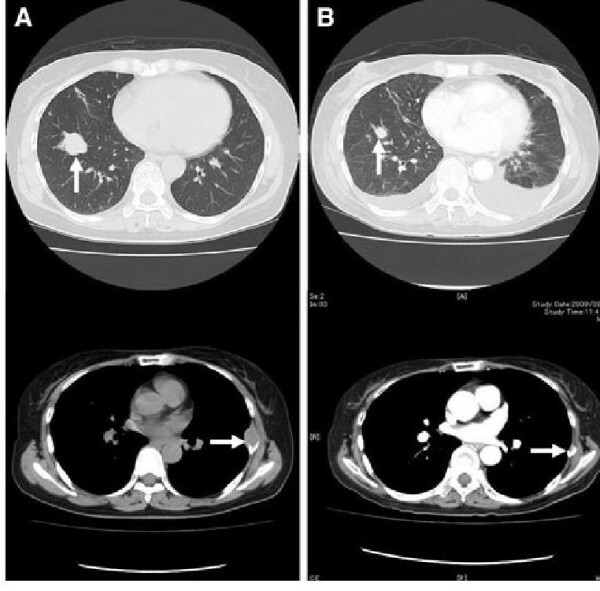 Metastatic lesion to the right lung and left sixth rib before (A) and after (B) 4 courses of sunitinib treatment. Because CDC is an uncommon and aggressive disease with extremely poor prognosis, accumulated information about CDC is very limited. Therefore, no established therapy for CDC exists except for surgical resection of localized diseases. To date, however, there have been 14 reported cases of metastatic CDC showing response to systemic therapy, consisting 9, 2, 1, and 1 who were treated by gemcitabine plus cisplatin or carboplatin, paclitaxel plus carboplatin, gemcitabine plus doxorubicin, and interferon-a, respectively [2–7]. Considering these findings in addition to the characteristics of CDC similar to those of urothelial cancer, chemotherapy is the currently favored approach for patients with metastatic CDC. In the case presented, because of her poor performance status associated with skeletal metastases, it was judged to be difficult to perform intensive systemic chemotherapy. Accordingly, she was treated with sunitinib, which has been regarded as one of the most powerful agents against metastatic RCC , and showed a partial response to this drug. Recently, the favorable clinical activity of sunitinib against non-clear cell carcinomas, including papillary and chromophobe carcinomas, has also been reported [8, 9]; however, this is the first reported case demonstrating a therapeutic response of metastatic CDC to sunitinib. Furthermore, a recent report presented a case of metastatic CDC showing response to sorafenib . Although the precise molecular mechanism involved in the antitumor activity of multiple tyrosine kinase inhibitors against CDC remains largely unknown, these findings suggest that the efficacy of these agents, for example sunitinib and sorafenib, against metastatic CDC needs to be prospectively evaluated. A retraction note to this article can be found online at http://dx.doi.org/10.1186/1477-7819-9-136. An erratum to this article is available at http://dx.doi.org/10.1186/1477-7819-9-136. EMT, IE, MFT and YA analyzed, interpreted the patient data regarding its oncological features, and has been involved in drafting the manuscript; HM and HE has given final approval of the version to be published. All authors read and approved the final manuscript.